Applying gamification to fitness wearables uses the basic fundamentals of devising tasks which makes physical activities exciting. A well thought out strategy of using powerful and positive emotions to drive health, making exercise fun, engaging and interactive. You hear it beep when its’ tracking you or warning you of danger! 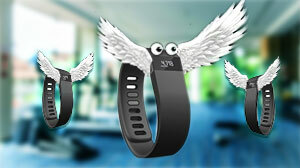 These Guardian Angels are Fitness Trackers, Activity Monitors or Fitness Bands! All fitness wearables are developed to track aspects like steps taken, calories burnt, integrated heart-rate monitors and goals accomplished. Some bands go a step ahead and offer users a lot more; from Instagram notifications to a direct connect to physicians. The bottom-line objective of these bands are to keep us on track, keep us motivated and help us achieve our fitness goals. Now that’s what Guardian Angels do, don’t they? Just like how Guardian Angels don’t all work in the same way, fitness wearable too are built to adapt to our personality. Some angels are more hands-on, some like to make it clear that they are with us and some are gentle and prefer to stand back and wait to be invited in. He, who has health, has hope and is happy! Being healthy and fit is the key to happiness, and fitness app developers are taking this responsibility on themselves. By just tracking and monitoring activity, users are not going to remain on the right path to maintain health, instead these app developers know that there is something about games, which brings out the competitive and challenging attributes about us. The never give up attitude surfaces and we like to combat the same challenge repeatedly till we master it. This is like an addiction, that when a goal is set we are more motivated to achieve and especially when we can see this directly translate into points, scoreboard, badges, etc. Six to Start, a fitness app company has developed an app that tracks a person’s running and transforms it into a story, in this app you are practically running for your life! Gamification merges with fitness apps well, as it integrates game-like features: scoring points, defeating monsters, reaping awards etc. bringing in a competitive and exciting factor. Fitbit Blaze, also provides an ecosystem of competition among friends, collaborative challenges, badges and rewards to keep users encouraged. Gamification in fitness use the basic fundamentals of devising tasks which make physical activities is exciting is well-thought strategies, using powerful and positive emotions to drive health. This makes exercise fun, engaging and interactive. Nike + Running app gave inspirational cheers throughout the run at various milestones. FitRPG transforms your Fitbit data into a character that can fight your friends, battle bosses, and go on quests using the steps, distance, and sleep. How does Fitness Tracking really work? Accelerometers: this device monitors your movement, and that if rockets too! This is the most basic and common tracker, mainly put to use for counting steps. GPS: I am sure I don’t need to explain this! However, did you know, the GPS comprises a network of 29 total satellites orbiting the Earth — at any location, a person should be in range of four satellites needed to pinpoint an exact location. Unlike simple step counting, GPS permits runners, walkers and cyclists to easily map their exercise and analyze the terrain where they were excising. Galvanic Skin Response Sensor: Recall lie detector test, stress levels, mood readers. Yes, this is what they are using. Essentially, the band is monitoring every sweat you break into! Bioimpedance sensors: Jawbone’s new UP3 wrist band uses a single bioimpedence sensor to cover three bases: heart rate, respiration rate, and galvanic skin response. The same sensor, worn around the wrist, will also be able to tell respiration and hydration by looking at metrics like oxygen in the blood. Temperature Sensors: Yes, I am talking about a thermometer. You also have UV sensors telling you to protect yourself from harmful radiation and ambient light sensors that tell you the time of the day. Now that sure is a lot of sensing and tracking by a tiny little band, to ensure you stay fit! Fitness wearables are also disappointing many users. Users are questioning the level of accuracy and are not able to employ these trackers in all physical activities like skiing, skating, swimming, etc. Sometimes information and analysis can distract us from getting to the core work and exercise intention. A study which was conducted between 2010 and 2014, with 471 random participants, divided the members in two groups. The first group manually recorded their physical activity for each day, whereas the second group relied on fitness trackers. The results of the study were surprising. The second group lost less weight than the first group, which logged their activity manually. But then, when you aren’t perfect, and I aren’t exactly perfect, why expect these Guardian Angels to be perfect? Yet? Every social interaction and every technology intervention needs to be done carefully and with checks and balance in place. Do the same with your fitness bands! “Beep..Beep”, ok my fitness band is asking me to blabber less and to now “blob away”! So it’s goodbye for now! Happy health to you too! Interesting read! I have been using fitness trackers myself for quite a while and have now taken fitness gamification to the next level. Combining the fitness tracker with an online challenge on Fitrockr allowed me to boost my activity level further.